Throughout the Lone Star State, Texas apple orchards provide incredible tasting, diverse, and reasonably-priced apples. Why buy from a grocery store when you can go straight to the source? Apples are always best freshly picked. Below, you’ll find seven spots where you can treat yourself to the best. At the Greer Farm in Daingerfield, Texas, they raise herbs, vegetables, hay, fruit, berries, flowers, pine timer, full blood red and white Maine-Anjou beef cattle, sheep, and more. They are happy to have visitors for cooking classes, to dine in, pick up some berries, see the animals, or even stay the night. And most importantly, be sure to grab a delicious bushel of apples! The Orchard in Idalou, Texas, is the state’s only Certified Organic Orchard. During the season, all you have to do is come to the store on-site from 10 a.m. until 5 p.m. to arrange for a hayride, then go out into the fields and pick to your heart’s content. Open Tuesday through Saturday. Love Creek Orchard in Medina, Texas, offers seasonal you-pick, usually beginning in April with blackberries and ending in October with persimmons. Stop by to pick peaches in June and July and apples and figs from July to August. Love Creek doesn’t charge entrance or parking fees, so visit as much as you like. Henrietta Creek Orchard in Roanoke, Texas, partners with many different organizations, including schools, universities, and researchers. Seasonally, it is open as a u-pick orchard, too. 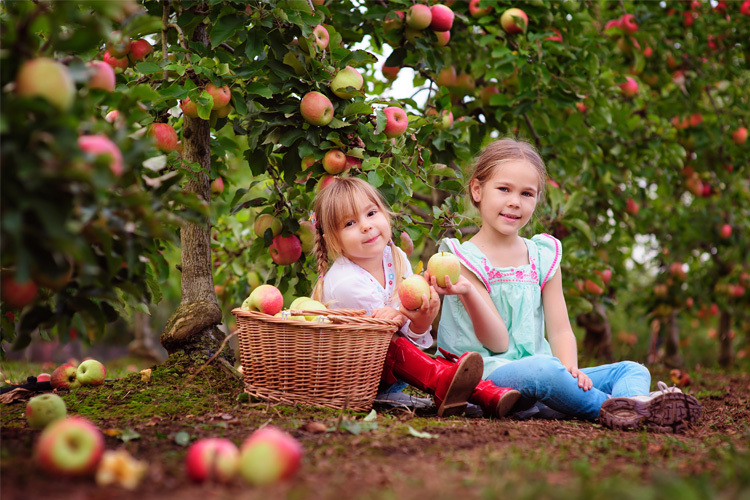 Available apple varieties include Golden, Fuji, Granny Smith, Pink Lady, Winesap and Enterprise, all starting in mid-September and lasting until October. Sonlight Apple Orchard in Mason, Texas, is a dedicated apple orchard with pick-your-own tree ripened apples available. Picking times change depending on the year, the harvest, and the weather, so make sure to call ahead or check their website before driving up. This orchard is home to a variety of apples, berries, and more. At their storefront, you’ll find freshly-made jams, ice cream, honey, essential oils, delicious apple-cider, and more. Apple varieties grown here include Gala, Fuji, Red Delicious, Pink Lady, Granny Smith, and more. For some of the freshest apples in the state, head to Efurd Orchards. With reasonable prices and a wide selection, Efurd is a good bet for excellent produce. Here, you’ll find apples, plums, peaches, sweet potatoes, blackberries, blueberries, and pumpkins, depending on what’s in season.